"Nothing that exciting ever happens to us. We're not worried." This is what Camille Flanders, a 1999 PAHS graduate, and her roommate in medical school at St. George's University in Grenada, told each other in the days before Hurricane Ivan hit the tiny island nation in the Caribbean Sea. But after surviving the storm, being evacuated from her dorm, hearing the roof of the house where she was staying ripped off by the 150-mph winds, and having her dorm destroyed, Flanders admits that surviving a hurricane was exciting. Indeed. Flanders is in her second term at St. George's University, having started medical school in Grenada in January 2004. The 133-sq. mi. island is located in the southeast of the Caribbean, 100 miles from the coast of Venezuela. Hurricane Ivan hit Grenada, a small island in the Caribbean Sea 100 miles from Venezula, in early September, causing massive damage. They heard about Hurricane Ivan on Sunday, Sept. 5. "Since it hadn't hit any other islands, people didn't know how big it was," said Flanders. Hurricanes don't normally hit Grenada, added Flanders, so no one really was worried. Two weeks earlier, a storm warning was issued in Grenada, including the evacuation of the smaller portion of campus, right on the beach, where Flanders lives. Then the storm turned out to be nothing. "So," explained Flanders, "we weren't worried." "I didn't really take it too seriously until Monday afternoon (Sept. 6) when we got an e-mail that said they were calling off class on Tuesday and reschedul(ing) it for Saturday," said Flanders. Since they have never cancelled class before, Flanders knew at that point that Hurricane Ivan might really hit Grenada. Some students tracked the storm on the Internet, but most are too busy to watch TV, including Flanders, who was still more worried about getting her homework done than the hurricane when she evacuated from her dorm on Monday night. Besides, it is impossible to predict a hurricane's course. When Ivan hit the United States, a 300-mile stretch from New Orleans to the Florida panhandle was listed as its possible landfall. So what are the odds that the hurricane would hit Grenada, some 20 miles long, directly? Flanders chose to go to a friend's house on a hill when evacuated, since the warnings seemed particularly centered on flood damage. She took her suitcase with a change of clothes, her books, her notes, her laptop, and her passport, money, and plane tickets. She was studying with her friend on Tuesday afternoon, around 1 p.m., when Hurricane Ivan hit Grenada. They had not really prepared at all, said Flanders, since the stores all closed as soon as the warnings were issued, so they had no chance to buy extra food and water. "We didn't realize how bad it would get until the storm came. It just kept building and building," she said. They studied until the wind got too loud and started to distract them. Then they noticed that the wind was pushing water into a bedroom through the cracks around the window. They were stuffing towels around the window when they accidently pulled the window out. With the water flying into the room and with them struggling to get the window back in place, Flanders realized that the storm was life-threatening. She realized that instead of worrying about their possessions getting wet they should be worried about their own safety. Since neither Flanders nor her friend had ever been in a hurricane before, they were unsure if this was the peak of the storm or not. But they moved to a back bedroom with only one window for safety. "Not too long after we got in there, the roof blew off," said Flanders. "That's one of the loudest sounds I've ever heard. I've never heard a galvanized roof blown off before, but when it happens, you know." The roof blowing off was the scariest moment of the storm, said Flanders. The wood ceiling was still mostly in place, but with the roof gone they could see the sky through cracks in the ceiling. Flanders and her friend climbed under the bed and stayed there for close to a half hour. "We just stayed under the bed, listening to glass shattering and the wind roaring," said Flanders. When the eye of the hurricane reached them, it got totally calm. Flanders and her friend rushed to find a safer spot, but they were barefoot and the house was full of broken glass. They found shoes and grabbed their most important belongings. When her friend asked her to get his wallet from his desk, Flanders went to his room but the desk was gone. Flanders and her friend joined a vet student and her husband in the lowest level of the three-story building, whose apartment was dug into the side of a hill. Their apartment had fewer windows, and they had boarded over the windows. By 4:30 p.m., after a half-hour break, the storm resumed. The second part of the hurricane was less severe but lasted longer. It wasn't until 10 p.m. that they went outside again. They ate leftovers in the rain and got the food and water from the kitchen and prepared to move to another friend's house. While packing the food in the kitchen, the water level in the kitchen rose from her ankle to her shin, said Flanders. They loaded a Jeep to drive to a safer location but the road was blocked, so they returned to the basement apartment to spend the night. The next day -ÊWednesday, Sept. 8 -Êthey found some of their belongings. Flanders' backpack was wet, but her laptop still works. She had her passport, money, and plane tickets. They walked to their friends'Êhouse and eventually cleared the road enough to drive the Jeep. They made several trips moving stuff to a safer location. On Wednesday, the embassy also arranged for Flanders to call home, for just a minute, to tell her parents, Jo and Mike Flanders of Paynesville, that she was okay. By Wednesday afternoon, Flanders went back to her dorm. "My neighborhood had been hit really hard, and it was really sad," said Flanders. "I go running a lot, and I see these people, and it was sad to see how much they had lost." When she got to campus, she could see her room. She could see through it actually, as the windows were gone and so was the door to the hall. Her refrigerator had been blown from the porch across the room, and the room smelled like a mixture of saltwater, fish, and food. Her clothes in the closet were still there, though wet, and she spent a day trying to dry them. While she and her friends dried their clothes, without clothespins, they had keep watch over them to ward off looters. While Flanders could have lost everything, her two most valuable possessions - her laptop and her motorbike -Êwere okay. The hardest thing to lose were her class notes, which she had spent so much time preparing. The main campus of St. George's University, which has tile roofs and better construction, held up better to the storm. While some buildings are missing tiles, said Flanders, for the most part it "looks great compared with the rest of the island." The next three days passed quickly, with students trying to gather possessions and dry their clothes, etc. Flanders drove some friends to the airport one day, which took hours due to traffic. On Friday, she moved to another house with friends. By then, the school was evacuating students to Barbados and the embassy was evacuating American citizens to Trinidad. Flanders thought about staying in Grenada and helping, but an airline was honoring return tickets from Grenada for emergency flights. She figured she had better use that offer or face having to buy an extra ticket later. So she flew to Barbados on Saturday with just a carry-on bag. After waiting for a flight for a couple days, she flew to Miami and then to Minneapolis on Monday, Sept. 13. Her classes are scheduled to resume by the end of the month somewhere in New York. The school is trying to rent lecture halls and dorm rooms. Some classes will return to Grenada, and others will resume their term at locations in the United States. Students have the option to start the term again in January, but with a month already invested Flanders wants to finish the term. Flanders thinks she will finish out this term in New York. Then she plans to return to Grenada after Christmas - since her family already has purchased plane tickets to come and visit her - and start the next term in Grenada again in January. Pictures of a hurricane don't really do it justice. They don't really capture its power, according to Flanders. Hurricanes are "something, if you don't see it, you don't really get the impact of it," she said. 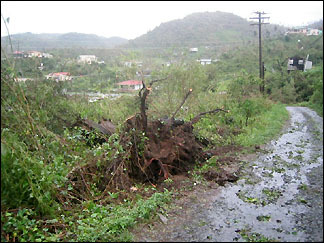 Hurricane Ivan was a class four storm when it hit Grenada. It reached class five when it hit Puerto Rico and then it proceeded to the gulf coast last week and damaged parts of the Florida panhandle, Alabama, Mississippi, Louisiana, and even Tennessee. The hurricane made Flanders' parents grateful to live in a small town, where people care about one another. Lots of friends called and asked about Camille, according to Jo and Mike. Flanders feels sorry for the residents of Grenada. The medical students at St. George's will be okay, she said, but the entire country was hit by the hurricane, so there is no help available from unaffected areas. The country will need aid to recover, she said. Anyone wishing to donate to Grenada, through the nonprofit research center, WINDREF, can contact Flanders.